Spring is here and it’s a perfect time to add some greenery or flowers to your home. Planters can get on the pricey side, especially if you’re decorating a whole room or outside area. 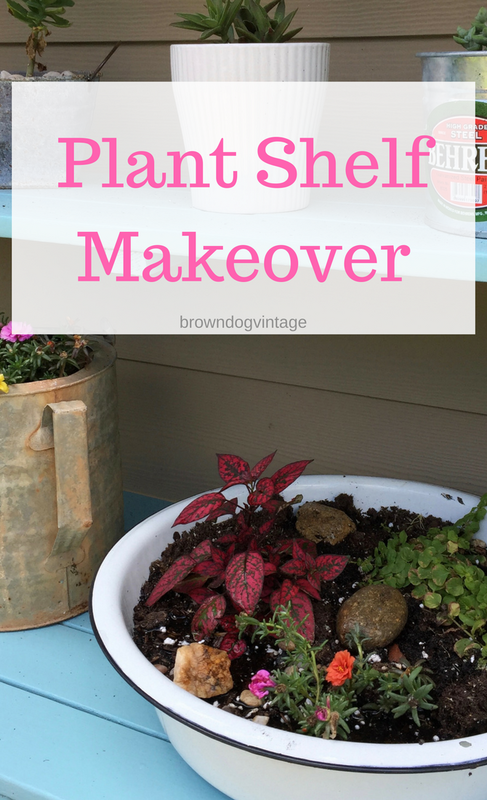 But, you can create your own with a simple makeover of a dollar store planter! 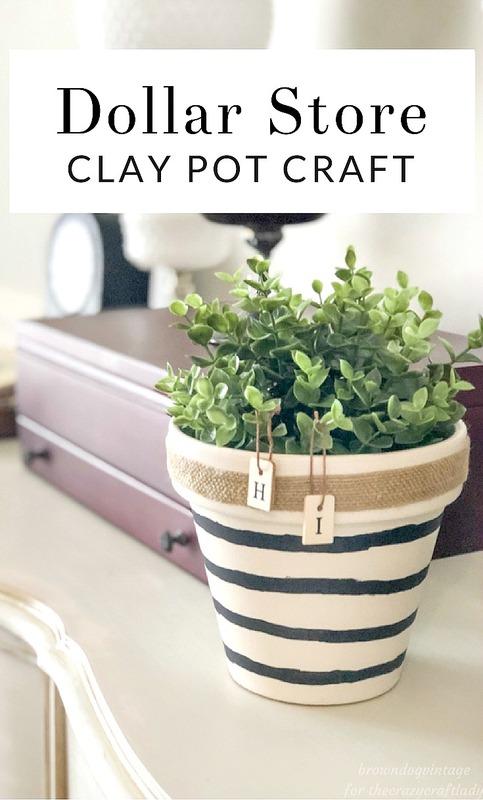 Grab a clay pot from the dollar store and give it a complete makeover with this easy tutorial. 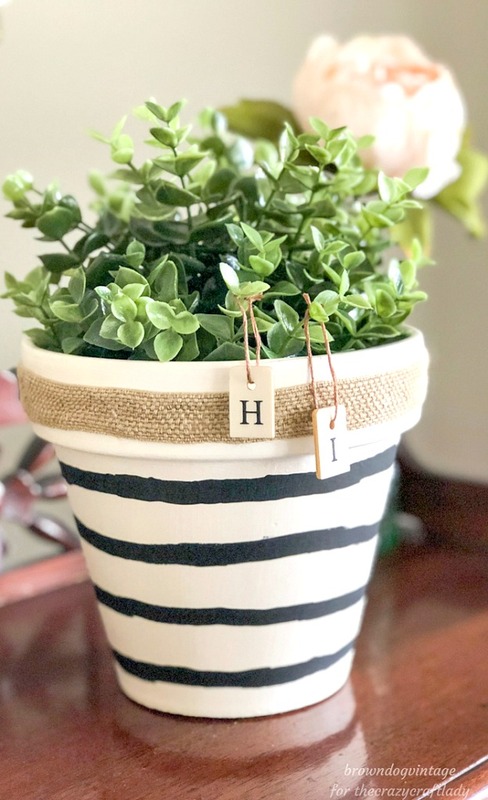 How to make a simple, neutral dollar store planter. 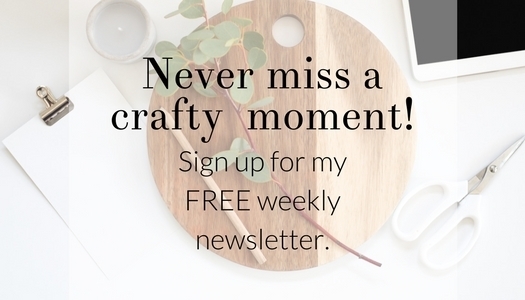 I’m Melissa from Brown Dog Vintage and I’m so excited to be sharing this project with all the Crazy Craft Lady readers! It’s a fun and simple DIY today – you could even do this one with your kiddos and let them get creative. I’m all for budget friendly ways to add some style to your house and I love simple DIYs. This one fits the springy bill! I recently found a pretty planter/jar type thing from the Target Dollar Spot and I was inspired to create something similar. Related: Customize a basic clay pot with favorite family photos and ModPodge with this Clay Pot Photo Gift. 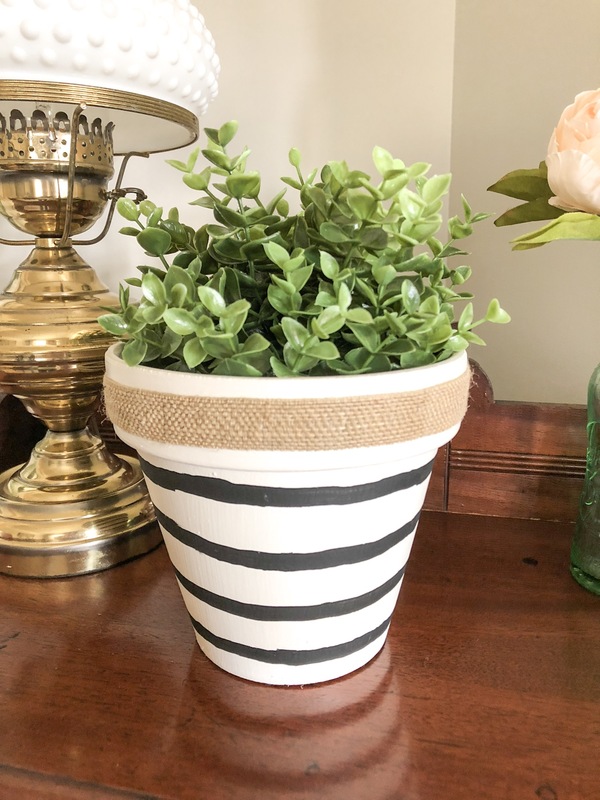 I’m making over a basic dollar store planter today to add to my recent spring update for the house. You can find these terra cotta pots at nearly every dollar store or hardware store and they are pretty inexpensive. Since I’m a certified plant killer, I’m adding some faux greenery to my happy little planter. You could always leave it a solid color, but I wanted to add a little more. I’ll admit, I tried a stencil the first time and it was a total DIY fail. So if you have a better quality stencil than I did, I’m quite certain it would look amazing – just don’t let me touch it! No big deal though. I wiped off the excess paint and repainted my base coat of white on the pot. Then I used a small brush and free formed some wavy lines around the pot. I was inspired by my most recent Target dollar spot jar for this step – I really liked the imperfect design of the lines. Add any greenery or flowers that you like. Succulents are a good choice if you have a black thumb like this girl. Plus, they require very little watering. Hang your letters on the pot and done! 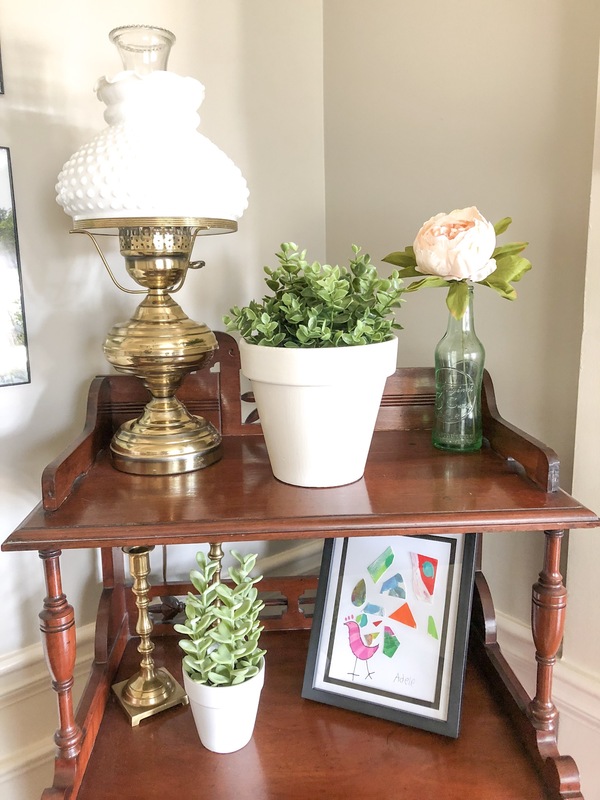 This dollar store planter makeover adds a new fun touch to my dining room and it didn’t cost me anything since I had all the supplies on hand. It’s such an easy and inexpensive way to add some new decor to your house without blowing your budget. 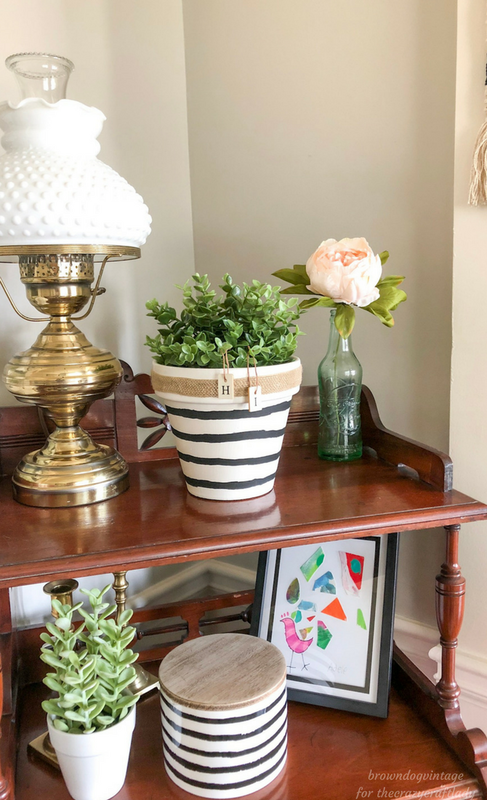 If you loved this dollar store planter makeover, check out my top DIY planter ideas from last spring along with a good lesson learned on an outdoor planter shelf!